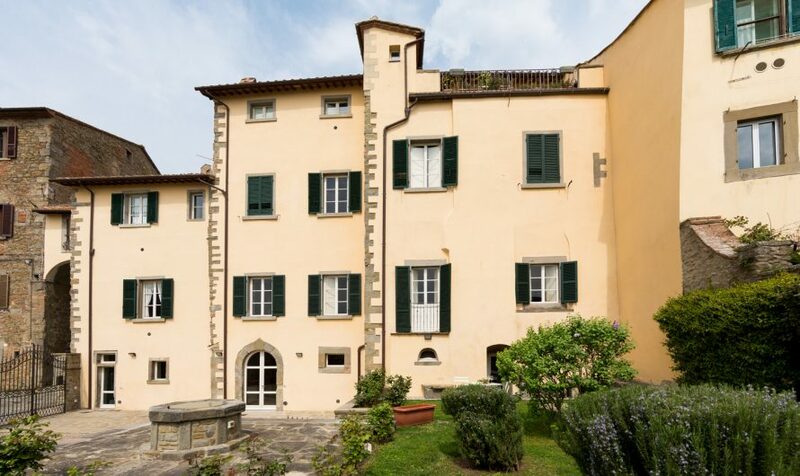 This splendid apartment dates back to the middle ages and it once belonged to a noble family. Imbued with history, Casa Coppi is full of character, from the intricate doors and door frames to the beautifully restored fireplace, now a settee. The spacious entrance to the apartment is furnished with a wooden table and chairs so it’s possible to enjoy here a convivial dinner, since the kitchen is easily accessed from this room. Furnished with all you will need to prepare delicious dishes, the kitchen is fully equipped with a stove, oven, an American-style coffee maker, fridge, toaster and kettle; an additional dining table and a window complete it. From the kitchen, some steps lead to the two bathrooms, both with showers. On the right side of the kitchen, a door leads to the first, well-appointed double bedroom. The second bedroom can be reached in two ways: either directly from the first bedroom, thanks to a door that connects them both, or from the spacious living room. The living room is furnished with armchairs, sofas, a mirror and antiques. It is the perfect place where to enjoy some family time, talk with friends or simply relax. Two long windows illuminate this space and afford beautiful views from this room. From the living room, a delightful communal garden can be accessed. Overlooking the beautiful panorama of Cortona’s rooftops and Valdichiana valley, it’s a tranquil corner where breakfast or a light meal can be enjoyed. A dining set for 2 is available for guests to use. 2 bathrooms, 2 showers, Wi-Fi, dishwasher, oven, cooker, fridge and freezer, American-style coffee maker, Moka pot, toaster, kettle, washing machine, clothes airer, ironing board, iron, hairdryer, cot and highchair upon request. The picturesque town of Cortona, made famous by the movie ‘Under the Tuscan Sun’ is perched on a hill overlooking the Valdichiana valley. This beautiful medieval town is rich in history and art, but also excellent restaurants, cafes and ice-cream parlors. All are within walking distance from Casa Coppi. A small supermarket is also less than 10 minutes away on foot and so are ATMs and the post office. The town of Camucia is less than 4 km away. Here one can find bigger supermarkets, shops, restaurants, pizzerias, a train station, ATMs, cafes and petrol stations. In Terontola, only 15 km from Casa Coppi, there are a small supermarket, ATMs, petrol stations, a post office and a train station (Terontola-Cortona). Airports: Florence 1h30, Rome 2h, Pisa, about 2h20. Closest railway station: Terontola-Cortona (for Florence and Rome). Taxes: mandatory tourist tax, to be paid in cash at check in. The tourist tax is €8 per person for the first week (except for children under 12 years of age).